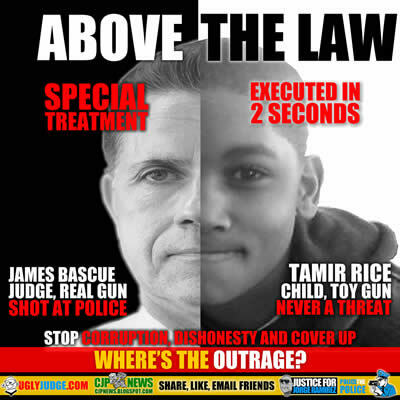 The tragic execution of 12 year old Tamir Rice is a common example of how there are two classes in America. The shooting was no mistake, no error and no act of a hero in any way. It was pure out of policy, erratic, violent and insane actions by officers who should never have been given deadly force or a badge. We must expose and stop the unfair practice of government destroying the character of the dead victims. They do this to help their cause when going to court, nothing more than propaganda to the public to go along with rationalizing murder. Yet the same officers who committed the crime are protected and their problematic history is protected and kept from the public. Some officers have killed several times and this is not shared with the jury or public. What is worse is government rationalizing public executions and the actions of obviously wrong, violent cops rushing a situation. There is no valid reason for what they did, no matter how you look at it this was an execution. Trained officers must be held to how they perform their duties. ARE THESE THE ACTIONS OF GOOD PEOPLE? Within two seconds of arriving on the scene, Officer Timothy Loehmann fired two shots before the patrol car had come to a halt, hitting Rice once in the torso. Neither officer administered any first aid to Rice after the shooting. The death of Tamir Rice, a 12-year-old boy who was shot last month by a Cleveland police officer who authorities say mistook the child’s air gun for a real firearm, has been ruled a homicide, the Cuyahoga County Medical Examiner’s Office said Friday. The November 22 shooting outside a Cleveland recreation center is under investigation, and Tamir’s family has filed a lawsuit against two officers and the city over his death. The homicide finding indicates that Tamir was killed by the police officer, rather than dying accidentally or by natural causes or by suicide. Medical examiners’ homicide findings make no comment on whether the killing constitutes a crime. The cause of death was a “gunshot wound of the torso with injuries of major vessel, intestines and pelvis,” according to paperwork provided by Christopher Harris in the medical examiner’s communications office. There was no special treatment for Tamir Rice, before they approached and after they figured out they made a mistake. In fact had their not been video evidence these cops would have gotten away with the typical perjury commonly used by police who are looking at murder charges. They lie, perjure reports and form false stories. Yet when caught lying nothing is done. 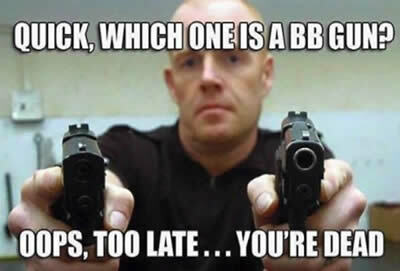 No matter what officers claim AFTER the fact, they always had a choice. To approach slowing, calmly and with care. Judge James Bascue on the other hand actually shot at police and (as a verified threat) should have been neutralized by police immediately. Yet this is not what happened. In fact this human life is getting special treatment in every form possible and most likely will get off with zero time in jail. Rice, a 12-year-old Cleveland boy, was shot and killed last year while playing with a toy gun by police officer Timothy Loehmann. Prosecutors last week declined to file charges against him. Two days after the decision was announced,Cleveland Metropolitan School District officer Matt Cicero posted the comments to his Facebook page. Rookie Officer Timothy Loehman shot Rice on Nov. 22, 2014 near a Cleveland recreation center. Rice, who had been playing with a toy pellet gun, died moments later. Loeheman said he believed the young boy to be a man in his 20s and claims he thought the gun was real. Both Loehman, and veteran officer Frank Garmback who was also at the scene, said they yelled at Rice to “show me your hands,” but surveillance footage shows the child was shot less than two seconds after officers arrived. On Monday, after a year-long deliberation, a grand jury declined to indict both of the officers on criminal charges. The decision sparked protests, with activists speaking out against a system that has consistently failed to deliver justice in police killings of black people — and often blames them for their own deaths. Was the Shooting of Tamir Rice “Reasonable”? Anger is Boiling Over the Outcome of New Probes Into the Police Shooting of a 12-year-old. Here Are 6 Takeaways.